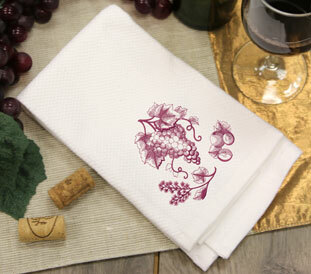 Designs in a variety of styles, themes, and colors are brand new -- and inspired by you! 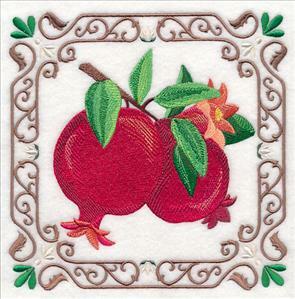 Each of this week's new designs are suggestions from embroiderers, including goldfish motifs, fresh fruit, Western flower power, and more! 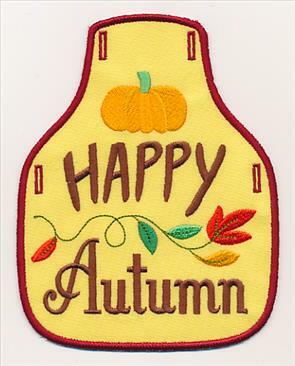 Whip up an autumn bottle apron for any fall get-together. 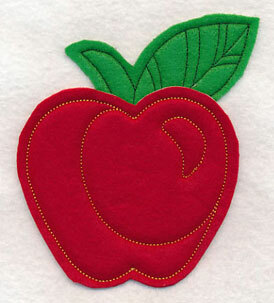 A crafty cut applique apple or pear stuns on kitchen decor. 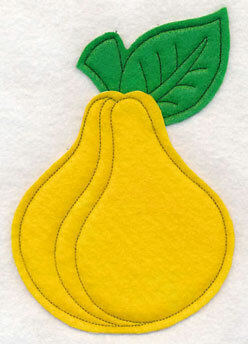 Or, create a quilt with tasty fruit botanicals! 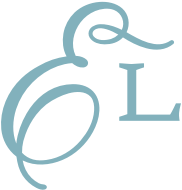 Scroll down the page to see these fabulous designs! 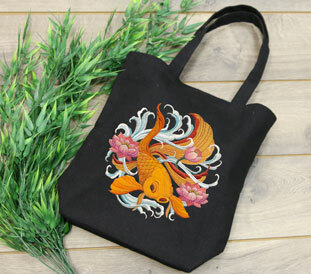 Colorful, brilliant embroidery pops against the striking black of this tote bag. 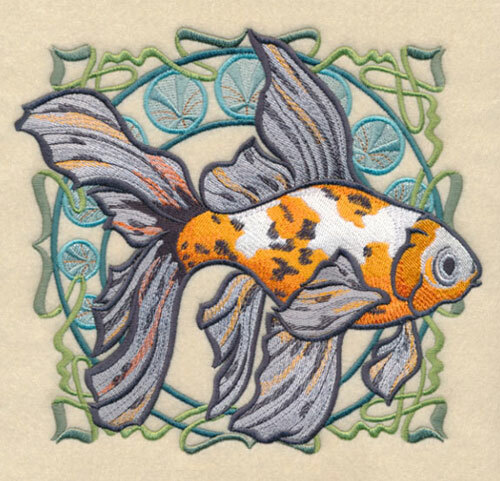 Anita wrote in saying she'd love to see some goldfish designs to use on cushions. 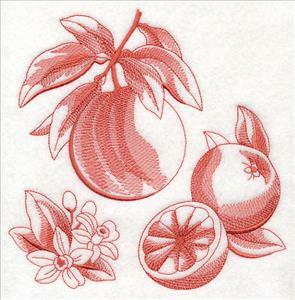 She specifically requested a stunning, Japanese-inspired motif like the one below. What a beautiful rendition of the popular fish! 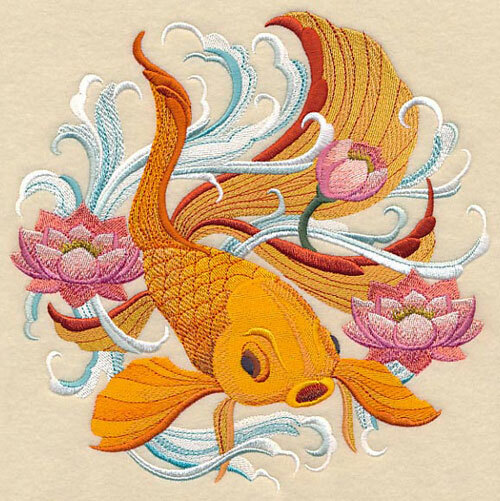 7.81" x 7.79" and 6.91" x 6.89" and 5.86" x 5.85" and 4.87" x 4.86"
An art nouveau theme gives this goldfish design an unexpected elegant edge. The classic details found in this type of artwork have been created to evoke images of water and seaweed. 7.58" x 6.90" and 6.45" x 5.87" and 5.35" x 4.87"
Fun swirls and bright colors are well-known markers of the classic flower power style. Here, new Western animals have been added to the current collection thanks to Grace's brilliant suggestion. 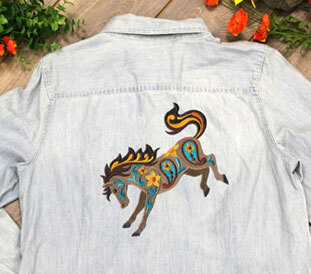 5.86" x 6.02" and 4.84" x 4.97" and 3.78" x 3.88"
A chambray shirt or denim jacket is the perfect place to let these animals shine. 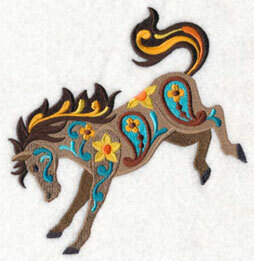 Get more information on embroidering on denim (plus fun project ideas!) in this fabulous mini-magazine. 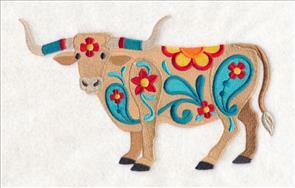 Six animals have been created for this colorful rodeo -- two horses, a bull, cow, beef steer, and longhorn steer. 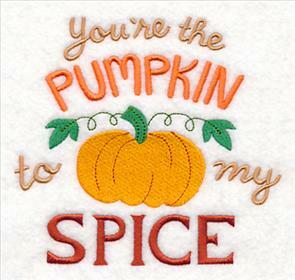 Add them all to a quilt, set of tea towels, or series of framed pieces! 8.31" x 5.64" and 6.87" x 4.66" and 3.89" x 2.64"
Use these fun designs on any Western project, or to bring a splash of color to a country kitchen. 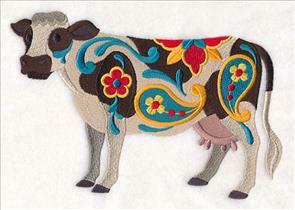 Plus, each of the swirls and accents inside the animals can be changed to match your decorating scheme, too! 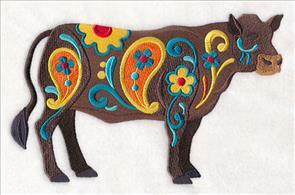 8.27" x 5.11" and 6.85" x 4.24" and 3.88" x 2.41"
Pick your favorite Western flower power animals, or stitch them all! Purchase them individually using the links above, or get all six in a design pack. 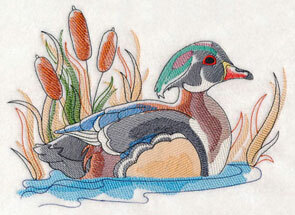 Robin really loves the sketch designs with color, and requested we add more birds to the collection. She was particularly excited about the idea of a turkey -- what a fun, seasonal idea! 9.68" x 6.90" and 7.79" x 5.56" and 6.80" x 4.85"
In addition to the turkey, two more woodland birds were added to the collection. 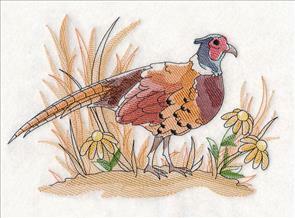 A pheasant and a wood duck make stunning additions to wall hangings, pillows, and more. 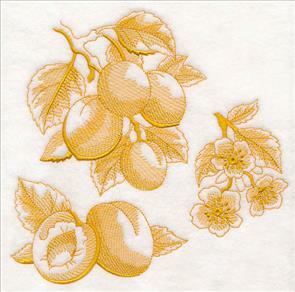 10.12" x 6.85" and 8.63" x 5.85"
9.48" x 6.85" and 7.80" x 5.63" and 6.84" x 4.90"
Marge requested even more Fruit Botanicals (Toile) after finishing stitching the first series. 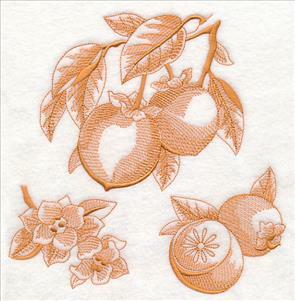 She loved the combination of the fruit on the tree, the cut fruit, and the fruit blossoms found in each toile design. 5.84" x 5.85" and 4.82" x 4.84"
7.76" x 7.78" and 6.86" x 6.87"
5.84" x 5.85" and 4.81" x 4.83"
Nine new fruit designs are available in this same toile style -- blueberries, grapefruit, grapes, kiwis, apricots, persimmons, pomegranates, avocados, and tomatoes. Terrific on any kitchen project! 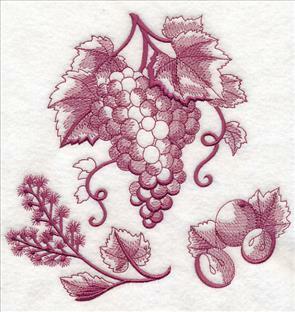 7.78" x 7.80" and 6.89" x 6.90"
5.84" x 5.85" and 4.83" x 4.85"
Create the perfect wine gift for any wine lover with the grapes design, or gift a variation featuring the avocados at a Mexican soiree. 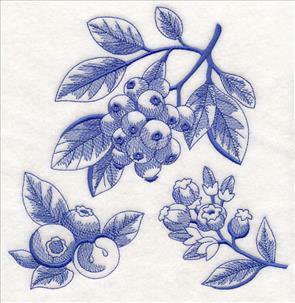 Tea towels, aprons, table linens, tote bags, quilts, and more are stunning when stitched with these toile fruit! 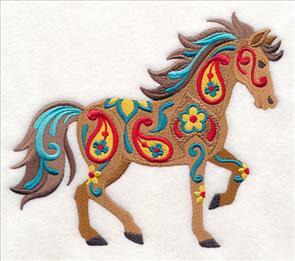 Toile designs feature light stitches and open areas that shine through, making them great for embroidering on smooth, low-nap fabrics. Anything with a heavy nap will lose the stitches in it's texture. 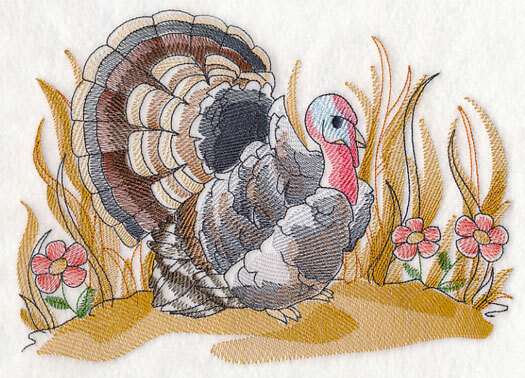 7.77" x 7.80" and 6.87" x 6.90"
5.84" x 5.87" and 4.85" x 4.86"
Solid-colored quilter's cotton, linen, twill, denim, or canvas are ideal fabric options for these toile botanical designs. 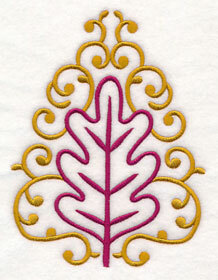 The designs are light and sheer, making them quick to stitch. 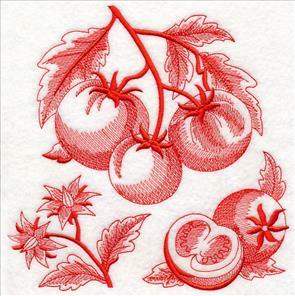 Embroider these robust tomatoes on gardening gear, reusable grocery bags, or home decor items, too! 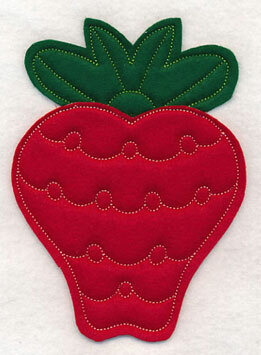 Terrific gift options for any foodie or fruit lover. 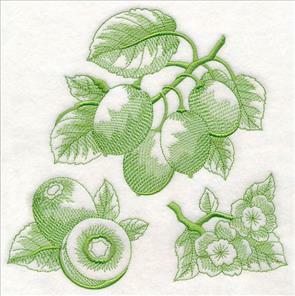 7.78" x 7.80" and 6.88" x 6.90" and 5.83" x 5.85" and 4.84" x 4.85" and 3.84" x 3.85"
Embroider a set of tea towels using these toile fruit botanicals! Find them individually using the links above, or get them all in a design pack. 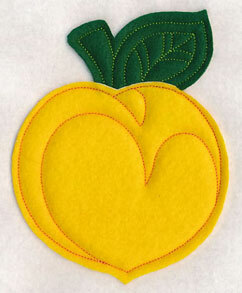 Several people loved the Country Veggies (Crafty Cut Applique) and were clamoring for fruit variations! 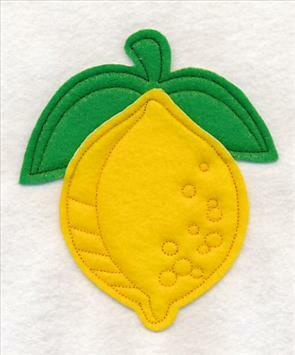 A sweet and juicy addition to any kitchen or garden project. 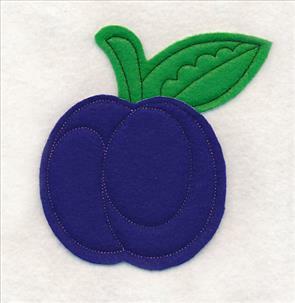 4.51" x 6.40" and 2.61" x 3.76"
These vibrant fruits are a tasty addition to tea towels, bunting, aprons, tote bags, and so much more! Pick your favorite project, and let your creativity shine. 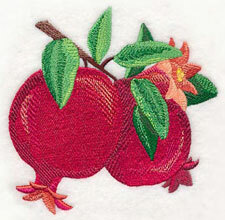 4.78" x 4.91" and 3.67" x 3.73"
The open fabric edges on these fruit designs add an extra crafty appeal. 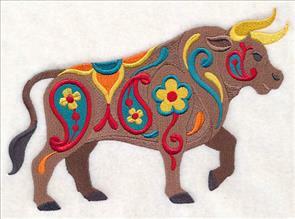 Decorative scissors can customize the designs even more. 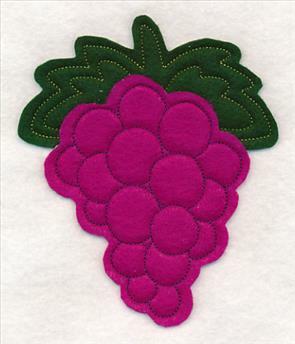 See how to embroider crafty cut applique in this written tutorial, or watch the video here. 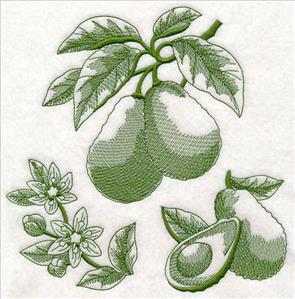 4.77" x 5.68" and 3.26" x 3.82"
Patterned fabric can bring a personalized look to the fruit designs -- stitch your favorites on a set of dish towels, or a quilt! 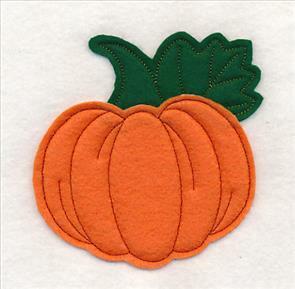 4.52" x 6.07" and 2.80" x 3.85"
A ripe, robust pumpkin is the perfect way to stitch fall's favorite orange fruit. 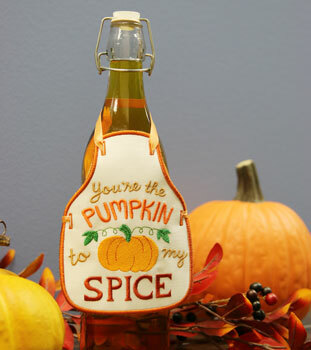 Terrific for autumn, Halloween, and Thanksgiving projects! 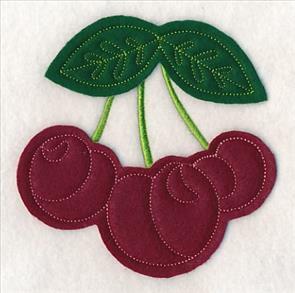 4.81" x 4.60" and 3.85" x 3.65"
Purchase the applique fruit designs using the links above, or get them all in a design pack. Dolly says she "love, love loves bottle aprons!" 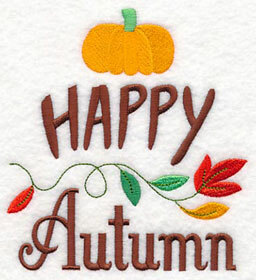 New versions to celebrate the changing colors of fall are the perfect gift idea for the season. 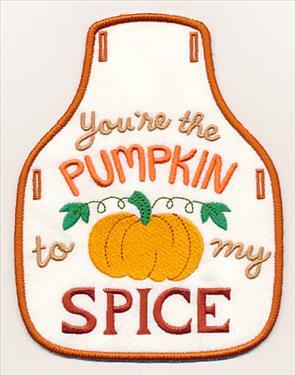 Three versions have been created: "You're the Pumpkin to My Spice," "Happy Autumn," and a swirling leaf. 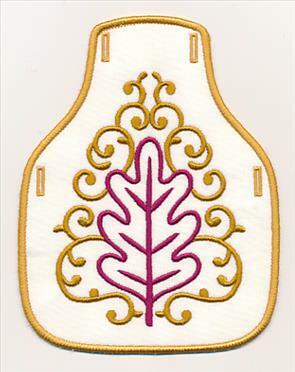 See how to create bottle aprons in the hoop in this written tutorial (and coordinating video!). 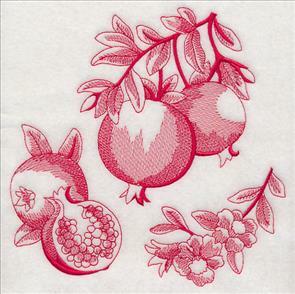 5.22" x 4.86" and 3.86" x 3.59"
4.86" x 5.30" and 3.53" x 3.86"
4.85" x 6.37" and 2.94" x 3.86"
Jane is a huge pomegranate fan, and describes them as "a beautiful fruit with a noble history in art and literature!" 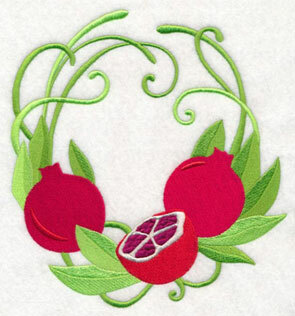 She was hoping for pomegranate versions of the Fruit & Tiles and the Fresh Fruit Wreaths. Great idea, Jane! 7.82" x 7.79" and 6.92" x 6.90"
4.96" x 4.89" and 3.50" x 3.49"
7.24" x 7.82" and 6.75" x 7.30" and 5.86" x 6.33" and 4.86" x 5.25" and 3.58" x 3.87"